Great Harvest Bread Company (GHBC) recently gave over $18,000 in free cookies to a non profit fund raiser. Adam’s bakery gives free bread to any non profit organization fund raiser. That’s right, free. 29 year old Adam Wong is a perfect example of a social entrepreneur. It’s funny because until a few months ago he didn’t even know he was one. This is the true example of a company w/ a dual bottom line, a social mission and profit mission. So how does this help his profit mission? The word of mouth advertising this brings to the bakery is phenomenal. With no money spent on traditional advertising, GHBC’s second location achieved the highest grossing sales for their opening day along and opening month. Now only a few months old, it’s still breaking records and all without a penny spent on traditional advertising. Adam has more where that came from. His Baker for a Day Contest allows a non profit to keep all proceeds for one whole day of GHBC operation. Adam got his start in technology startups when he left investment banking and returned to Hawaii from UCLA. He started three companies prior to GHBC. Adam is also into real estate investment and development. Welcome to Greater Good Radio Adam. Can you tell us a bit about The Great Harvest Bread Company and what they do? How many franchises are there in the national charter? How did you find the franchise and get started? You work with your wife, what does her role entail? What made you decide to come back to Hawaii? What did you learn from your previous businesses? Can you share with us your community related projects and promotions? How has that helped your business? How did you choose the GHBC franchise? How did you gain financing? What mistakes do you see others make when starting a new business? Adam Wong graduated from Iolani H.S. 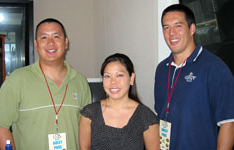 In 1998 he co-founded E808.com, a pioneering Hawaii web retailer. Then he co-founded a web design and software startup called Parallel 21 which has designed sites for Victoria Ward, Ltd, Kahala Sportswear and software for Maui County. His most recent venture is called the Great Harvest Bread Company Hawaii with opened their first location in Kahala in November of 2003. Great Harvest opened their second location in downtown Honolulu in May 2005 and is in the process of opening 3 more locations in the next year. Adam has numerous business ventures including real estate investments and development. Adam is recently married and his wife Chelsie also works in the GHBC business. In his free time Adam likes to surf, coach basketball and work within the community.